I'm not sure whether it reflects any particular cultural turning point in India - or just events in the lives of the people who make the movies - but whatever the reason, the early 80s produced a cluster of excellent films about adultery. I've written before about two of these, Arth and Masoom. 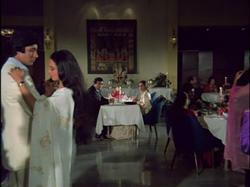 Another is Silsila ("Connection"), a film which illuminates the interplay between duty and desire, and which was perhaps at the vanguard of the adultery-film phenomenon. Amit Malhotra (Amitabh Bachchan) has fallen madly in love with Chandni (Rekha) and plans to marry her. He and his brother, fighter pilot Shekhar (Shashi Kapoor) plan a double wedding: Amit to Chandni, and Shekhar to his patient fiancee Shobha (Jaya Bachchan). When Shekhar is killed in the line of duty, and Amit learns that Shobha is pregnant, Amit decides to marry Shobha out of a sense of love and duty toward his brother's memory. Without explanation, Amit breaks off his relationship with Chandni and marries Shobha. Circumstances conspire to reunite Amit and Chandni, though, and although she is married to a good, kind man (Sanjeev Kumar), the spark between her and Amit burns too brightly for them to resist. They begin a steamy, clandestine affair, but both their marriages crumble as the secret becomes increasingly difficult to keep. Silsila's resolution is abrupt, overwrought, and contrived, and arguably compromises the integrity of the story. Nevertheless, the film up to the last 20 minutes or so is deliberately paced, tense, and believable. Its realism and sensitivity is driven by the performances of its principals. Before Shekhar's death, Amit is the brash, boisterous hero archetype that Amitabh played in so many of his films; afterwards, though, Amitabh transforms the character, as Amit bends and breaks under the weight of his grief and the sacrifices he feels he has to make. Both Amitabh and Jaya convey a sense of people reluctantly doing their duty and willing themselves to be, if not happy, then at least stable and not miserable. The true star of Silsila, though, is Sanjeev Kumar, whose performance is amazingly nuanced. His Dr. Anand carries in his face and in his body the fear that he is losing Chandni. In one stunning scene, Chandni sees Anand off on a business trip; Anand hesitates to leave her and board his plane, and his anxiety that she may leave him before he returns is palpable. Sanjeev Kumar is one of the era's most subtle actors, and his moving performance in Silsila shines. The weak link for me among the work of the four principals (five if Shashi is included) is Rekha. I have never really warmed to Rekha, except in Umrao Jaan, a role I think she was born to play. In Silsila, she is a little too breathless and ephemeral a match for the solid and earthy Amitabh. This is clearly just my opinion, though, as the two actors were long rumored to have shared a steamy romance in real life, and many Bollywood fans consider them a perfect pair. Indeed, Silsila's casting is rather remarkable, as the film portrays Amitabh married to his real-life wife Jaya, having an affair with his putative real-life mistress Rekha. It is hard for me to imagine what this must have looked like at the time, to observers both within the industry and among the janta, the general movie-watching public at large. At any rate, my cold response to Rekha, combined with some weaknesses in her character - Chandni seems driven entirely by Amit's wishes and takes no decisive actions of her own - left me somewhat emotionally detached from her part of the story. She came to life only when she smiled - or danced, as in the sparkling "Ladki hai ya shola" ("Is she a girl or a flame? "), marking Chandni and Amit's first meeting. Other memorable songs include the Holi festival number "Rang barse" - a pivotal moment in the story - and "Dekha ek khwab" ("I had a dream"); the latter is a great song, but the picturization is a little cloying, as Amitabh and Rekha roll around in Dutch tulip fields.